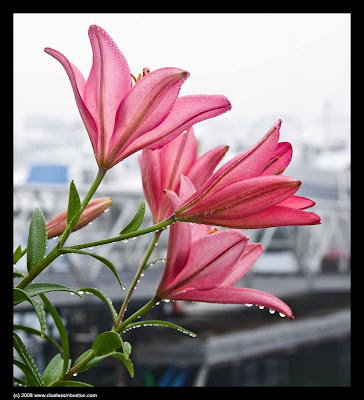 Flowers on a wet and foggy morning at the seacoast. Is that morning dew or rain. Wonderfully captured. The droplets are so rich in light and colour on the larger image. Beautiful. Love the raindrops on these beautiful flowers. This photo is just about perfect. Good call on adding the border too. Bravo! lovely pink flowers. they're lily, right? This is a beautiful . . . one of your best flower images. The details are gorgeous when you enlarge it. Gorgeous!! I love the color and the raindrops!! Great shot! !